The book is a psychoanalytic understanding of psychosis as a particular organisation of the personality, based on 'psychotic personality' (Bion) and 'pathological organisations' (Steiner). The theoretical development is traced through Freud, Klein and Bion, along with contemporary Kleinian authors. An important role is granted to psychic pain as the cornerstone of psychopathology, and particularly to the psychotic patient's difficulties in dealing with it. Bion's distinction between "feeling psychic pain and suffering it" is considered an indicator when evaluating the patient's ability to cope with psychoanalytic treatment. The author's experience with a schizophrenic patient is related in detail, offering a view of the patient and her relationship with the analyst from various different angles, and showing how the psychoanalytic method can be used to treat psychosis. 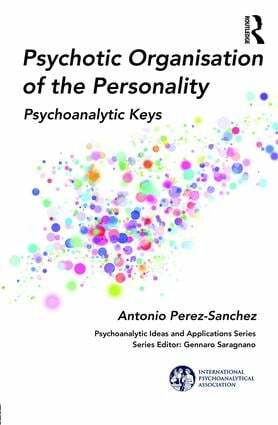 Antonio Perez-Sanchez is a psychiatrist and psychoanalyst. He is a training and supervisor analyst of the Spanish Psychoanalytical Society and was its president (2008 to 2012). He is currently chair of the IPA Sponsoring Committee for the Portuguese Study Group NNP, and a member of the European team of the IPA Encyclopedic Dictionary. He has written papers on anxiety, envy, psychic truth, forgiveness and temporality, apart from other technical articles about psychotherapy and psychoanalysis. He is the author of five books, written in Spanish, about psychotherapy and ending analysis. One of them has been translated into English (Interview and Indicator in Psychoanalysis and Psychotherapy, London, Karnac Books, 2012) and Italian (2014). The aim of the The International Psychoanalytical Association Psychoanalytic Ideas and Applications Series is to focus on the scientific production of significant authors whose works are outstanding contributions to the development of the psychoanalytic field and to set out relevant ideas and themes, generated during the history of psychoanalysis, that deserve to be discussed by present psychoanalysts.